How Much Is 3D Systems Corporation Investing for the Future? A deeper look into 3D Systems' capital expenditures and what that says about the company. Having made in the neighborhood of 50 acquisitions in the last three years, it's clear that 3D Systems (NYSE:DDD) has decided to go the acquisition route to primarily fuel its future growth and pursue its market opportunity. From an accounting perspective, 3D Systems' hyperactive acquisition strategy has made it difficult to track how much capital -- aka cash and cash-generating assets -- it has been investing toward its future. To tune out the noise, investors can examine 3D Systems' adjusted net capital expenditures to see if it's investing for future growth, only investing to maintain its current operations, or depleting existing cash-generating assets faster than it's replenishing them. Combined with the rate of return that 3D Systems generates from the capital it invests, investors will be able to get a better sense if the company is making the most out of its recent investment initiatives. In order to arrive at adjusted net capital expenditures, we must first determine 3D Systems' net capital expenditures, which is the difference between its capital expenditures and its depreciation expense. For a company that makes few acquisitions and has low R&D expenses, net capital expenditures can effectively measure whether it's investing in future growth (positive number), maintaining its current operations (near zero), or depleting its cash-generating assets faster than it's replenishing them (negative number), which could be viewed as a bad sign. Source: SEC filings, author's calculations. Dollar figures in millions. *Includes amortization. Because 3D Systems has used acquisitions primarily to fuel its growth, its net capital expenditures tells a misleading story: that it's depleting its assets faster than it's replenishing them. In order to get the complete story of how much 3D Systems has been investing in growth, we'll need to calculate its adjusted net capital expenditures by adding research-and-development expenses, net of amortization expenses, and then adding how much 3D Systems has spent on acquisitions to its net capital expenditures. Source: SEC filings, author's calculations. All dollar figures in millions. *Amortization of intangible assets. Based on its adjusted net capital expenditures, 3D Systems has invested nearly $480 million toward future growth in the last three-and-a-half years, the majority of which stems from its aggressive acquisition strategy. Another factor to consider alongside how much 3D Systems is investing for its future is the return it generates from the capital it invests into its business. I've chosen to measure 3D Systems' cash return on invested capital, or CROIC, which measures the amount of cash that 3D Systems generates for each dollar it invests into the operation, expressed as a percentage. CROIC is calculated by dividing free cash flow by invested capital, aka the total investment that shareholders and bondholders have made into the company. Because 3D Systems doesn't currently carry any debt on its balance sheet, its invested capital is equal to its shareholder equity, which stood at about $1.3 billion last quarter. 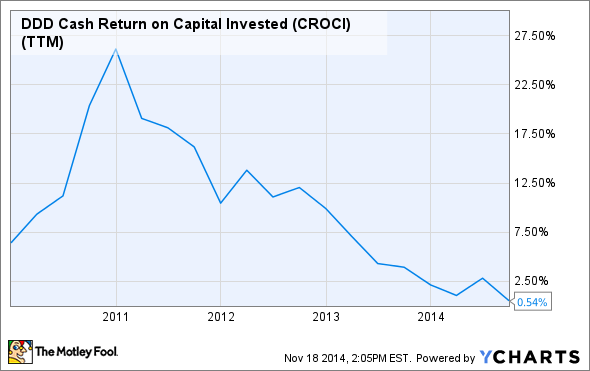 DDD Cash Return on Capital Invested (CROCI) (TTM) data by YCharts. Because CROIC is calculated from total capital and not from adjusted net capital expenditures, it isn't an exact measure of the return that 3D Systems generates from its adjusted net capital expenditures, and is more representative of 3D Systems' overall ability to turn money into more money. The above chart makes it clear that 3D Systems' capital investment returns have been diminishing in recent years, suggesting that 3D Systems' may not be making the right kinds of acquisitions, management isn't executing properly, or the payout from its multiyear aggressive investment plan hasn't occurred yet, and the plunge in its CROIC is only temporary. Reasoning aside, 3D Systems isn't operating as efficiently as it has in the past -- which could be a troubling trend for investors if its doesn't rebound in the future. Eventually, investors will want to see 3D Systems' CROIC rebound to levels above their cost of capital, which is a fancy way of saying the required rate of return that an investment must provide in order to be worthwhile. While cost of capital will likely vary from investor to investor, it should arguably be greater than 8% -- the long-term average return of the stock market -- given the additional risk of owning an individual stock over buying a broad-based index fund. As a 3D Systems shareholder, I'd like to see its CROIC rebound to levels above 12%, which would signal to me that the company has a strong handle on making investments that create long-term shareholder value. At this moment, 3D Systems' aggressive growth strategy, fueled with acquisitions, strategic partnerships, concentrated product launches, and increased research-and-development spending, appears to be more of an operational challenge than an operational advantage. The diminishing CROIC returns that 3D Systems has been generating could be another piece of evidence to suggest that management has become distracted -- perhaps because it's being pulled in too many directions, which is diverting its focus from operational efficiency. The other possibility is that enough time may not have elapsed for 3D Systems' aggressive investment strategy to pay off -- and investors need to remain patient. Either way, 3D Systems investors should continue to monitor the company's CROIC going forward for evidence of a rebound, or to substantiate whether 3D Systems is a stock that's best avoided.